If you are a veteran of the United States Military then when doing your 2017 VA Mortgage Rates Comparison you will be in for a great surprise knowing that VA Loans have had the lowest mortgage rates since they have started to be tracked almost 3 years ago. When comparing VA Loans against FHA Loans, Conventional Loans, USDA loans, and Jumbo Loans, VA Loans blow the other loan programs out of the water. If you are a veteran borrower, the service you have given our country is rewarded by the VA Loan Guaranty Program which is meant to make home ownership affordable for military veterans. When you look at the information provided by Ellie Mae who is a mortgage software company who supplies the software that processes nearly 4 million loans annually they have access to date of what loans were actually closed and funded and not what was quoted per Freddie Mac’s information. Per Ellie Mae’s information, VA Loans routinely are significantly lower by the tune of 25 points or more on average. It is also seen that VA Loans get approvals easier than all other loan types due to the relaxed lending requirements for these loans. You can see why when you look at 2017 VA Mortgage Rates Comparison there is no question where the best rates are. Data From Closed Mortgage Only: The first reason why the Ellie Mae rates are higher than Freddie Mac is the fact that they use actual data, from real lenders of closed loan. Freddie Mac reports on quoted rate and since quoted rates don’t necessarily result in closed loans, this can be deceptive. Not Every Loan Has Discount Points: Another reason that Ellie Mae reports rates that are higher is due to discount points paid. Paying for Discount Points allows you to obtain a lower mortgage rate and a lot of the time Freddie Mac quoted rates have discount points included in order to show lower. Since these points are options, the rate that closes could be 25-75 points higher than the quoted rate if discount points aren’t purchased. Tracking of All Borrowers: The final reason why Ellie Mae rates are higher than Freddie Mac’s is due to the fact that Ellie Mae takes all borrowers and loans closed into their formula while Freddie Mac looks primarily at prime borrowers only or those with the best qualifications. Just by using this factor alone, you can see why Ellie Mae reports are higher than Freddie Mac. 2017 VA Mortgage Rates Comparison: Is It Time For A VA Loan? 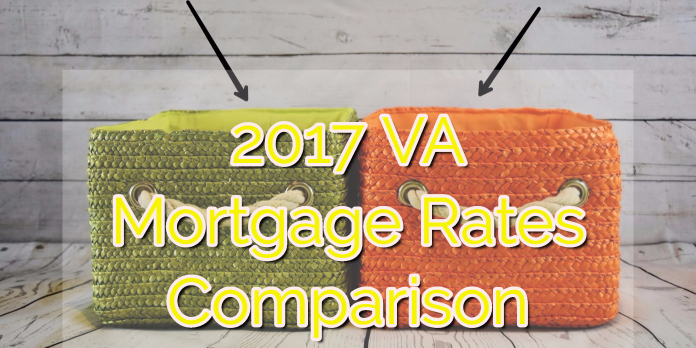 As you can see on the 2017 VA Mortgage Rates Comparison, now might just be the right time for you to use VA Loan benefits and get the cheapest mortgage rates around and enjoy all the great features they have. VA Loans offer 100% financing and after seller’s concessions can leave you with a mortgage without any money out of pocket. We have touched on VA Loans a bit lately and it is for good reason due to the fact that minimum credit scores vary by lender but go as low as 580 FICO and there isn’t a mandatory debt to income ratio that needs to be followed. Just these 2 reasons alone show why a VA Loan is the best bet for you if you have the COE or Certificate of Eligibility to get started. If you are looking for an experienced VA Lender then you need to contact us today and we can get started on your file immediately! Please don’t hesitate to call at 888-900-1020 or email us at contact@loanconsultants.org.